What an exciting week this will be! The Twinery's Maraschino and Charcoal Baker's Twine. 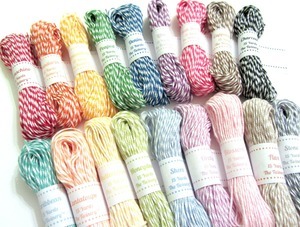 twine as a border is to use a fine point glue pen (such as Martha Stewart's brand). 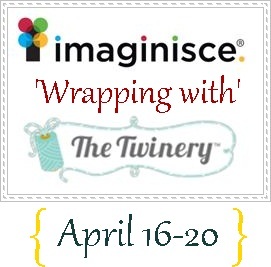 Both Imaginisce and The Twinery will be having a give-a-way! (This is an album that I created with Makin' Waves and is not an actual prize). The album also sports TONS of The Twinery Baker's Twine...you can see more photos here. I hope that you thoroughly ENJOY this fabulous week of hopping! Super super cute! I love the flowers and the baker's twine outline - great idea! TFS! So cute! Love the way you used the twine as a frame! Fun project, great lo. Love the flowers! I absolutely love those flowers! Beautiful layout! Love the B+W photos and the colors on your LO! 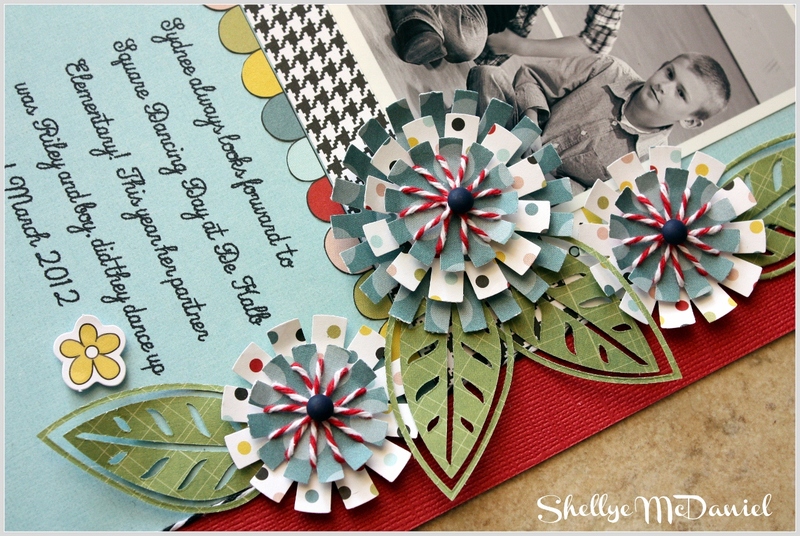 How clever to use the I-top paper punches to make the flowers! And I want to know more about that Flip Flop album, that is adorable! These projects are just too cute. I love them both. the twine is used so well as a flower addition. I love the flip flops. Thank you for sharing. THis is a fabulous layout and the album is uber cute! beautiful projects! love how you used the twine in your LO for the flower centers and the border. Wow what great Layout and Album cool Idea for this Saddle Album great papers and elements. Love the papers and the colors the attention to details are perfect and the Twine used for the middle of the flowers is great. thanks for sharing and for the chance to win. You flip flop album is wonderful!! Love this paper line and have loved the twine for a while......great job. Awesome layout-I LOVE the flowers!! Love your layout and you little album, love the colors! Soooo pretty! You totally rocked those flowers! I need to know how you did those leaves! BEAUTIFUL! Great layout! Love the twine accents as a frame and in the flowers. Those leaves are pretty fabulous too, and that flip flop album is just too cute! Great layout and really fun use of twine. Beautiful LO and you rocked that album you made with the Makin Waves collection, love the bright colors in the collection. Flip flop albums are always my favorite! Gorgeous layout, I can see why everyone was asking about the leaves. Good tip on using the twine as a border, I wasn't sure how people were doing that. Love how you did the flowers in the layout. Your creativity is over the top! I would've never thought to use the I-top punches that way. Tooooo cute! TFS! cute, cute, cute Shellye! love how you've used the twine! Love your use of Twine on your LO!! Great projects! I love the flowers! Beautiful layout!! The album is way too cute!! Thanks for sharing. What great flowers! such a nice layout! great job. Great layout!! Love how you used the twine. What a beautiful LO and adorable album! I love them both! Love it, Love it !!!! What an awesome album! That must have taken a while to make. Cute! Love what you did to the flowers! Beautiful layout!! Love the black twine outline! And those flower centers are just too cute! Love your projects! and that layout is just beautiful! 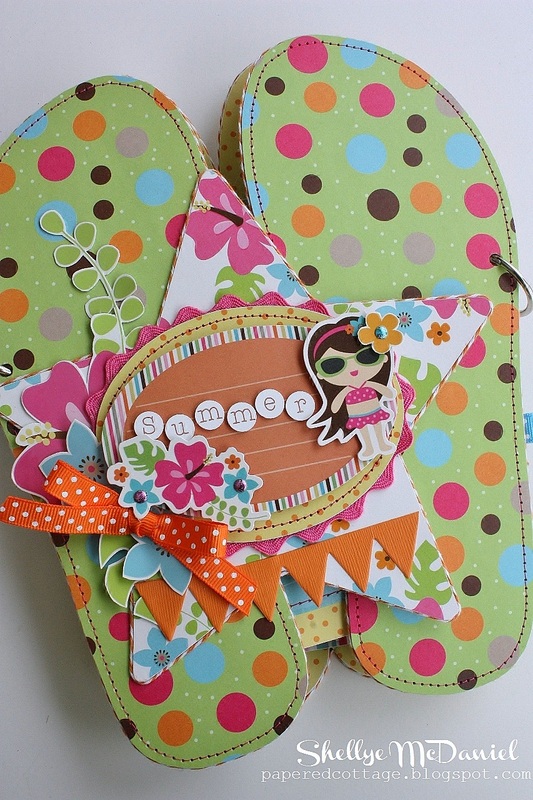 Gorgeous projects, love the flip flops! Beautiful projects on the hop, thanks for the inspiration! nice projects. thank you for sharing. Flip flops are SO cute! Great layout--I like how you used the twine on the flowers. I just love that layout and the flowers and leaves are awesome. Love how you used the twine in the centers of the flowers. Adore the I-Top flowers with the twine accents! Wow, love your layout. What a wonderful way to use the twine to frame your photo! I love your layout!! Thank you for sharing. Gorgeous layout. Your mini album looks amazing! Your use of the twine on those flowers was so cute, what a great idea. Hope I can remember that. Enjoying the blog hop. Wow, your layout is stunning!!! I just love the flowers and I also love your super cute flip flop project.. I love your layout and the way that you have incorporated the twine into the flowers is awesome!! Great LO and your album is awesome! I love the way you used the twine - I am going to play with my iTop and make flowers just like this! Thanks! Lovely lo, what a clever way to incorporate the i-top tool punches as flowers, another reason I should get mine!!! Love the flip-flops. So cute. Great layout, tutorial and tips. Loved the album too. Thanks for sharing. Such a cute layout! I love the flowers!! Love the flip flop album! Great accents on the page layout and I lovde the flipflop book! Love the way you used the twine on the flowers! Love your layout and how you used the twine with your flowers. The way you wrapped the twine around your flowers is pure genius! Love your flowers. They are so neat looking. Love your layout. You did a wonderful job. Oh Wow!! Love your ideas - awesome!! You are so talented! How come I never thought to use the itop punches on their own?? Great idea and LOVE how you used the twine. Ythanks for sharing! flip flops, oh my goshhhhhh! Fabulous projects Shellye. So cute. TFS. I now need to check out your whole blog! So many cute things!! Shellye both projects are fabulous. Love your color schemes. TFS and for being part of this fun hop. Your album is just beautiful! I loved the flower technique you shared...I will definitely be trying that. lots of pretty things here at your blog, nice show casing of the papers and twine. love your lo and your album using Making Waves which is so fun and colorful! Love your flowers with the wrapped twine, but the framing with the twine is such a great idea! It really makes it pop!! Love your leaves and the twine is a fabulous outline for all the items! Your layout is gorgeous and such cute pictures. What an awesome album using Makin' Waves ~ coolest paper ever!